Please refer to our stock # T 1703 when inquiring. 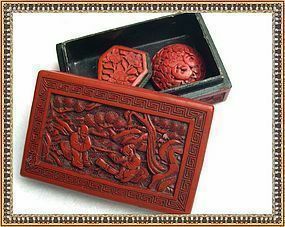 Box showing two figures sitting under trees, 4" X 2 1/2" X 1 1/2"
Dress clip marked: Made in China at 1 3/4" X 1 1/2"
Button - big circa 1918 antique Chinese carved red floral 1 1/2"
... making this a very nice 3pc lot from a New England household. All three pieces display shiny smooth high relief carved areas and the recessed areas are linty and dusty from age. Please collect with confidence after reviewing the dozens of Trocadero verified testimonials then view all extreme closeup images for full details as all Qs will be answered here in lieu of email reply. Will consider individual item order.